What kinds of stories and memories does your clothing hold? Do they fill you with raw emotions, do they make you wonder about the future, or do they whisper nostalgia and loss? 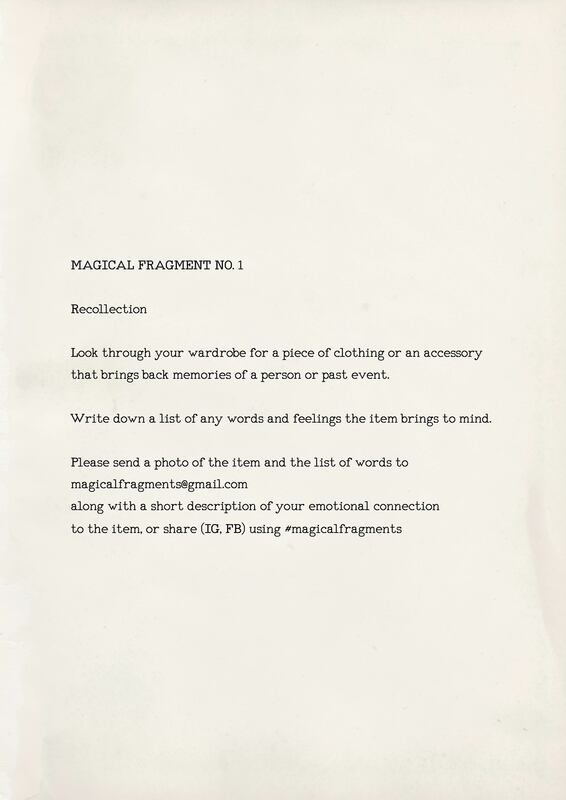 Explore the emotional and mnemonic contents of your wardrobe with these ‘intervention scores’ and find the stories hidden within your clothes. We are surrounded by objects that hold meaning and memories; material things that are affectively connected to our narrative identities. Commodities can become powerful mnemonic devices that evoke feelings and memories of past relationships and thus embody added value for their owners (Moran, O’Brien 2014). We form emotional bonds between objects, people, and moments through association and ‘magical thinking’ that shifts through context, time, and space. As an aspect of mind, magic is universal to human beings (Greenwood 2012) and is part of the storytelling mind. Magical thinking is essentially a way to construct meaning and connect with the present moment through a heightened state of affective being. 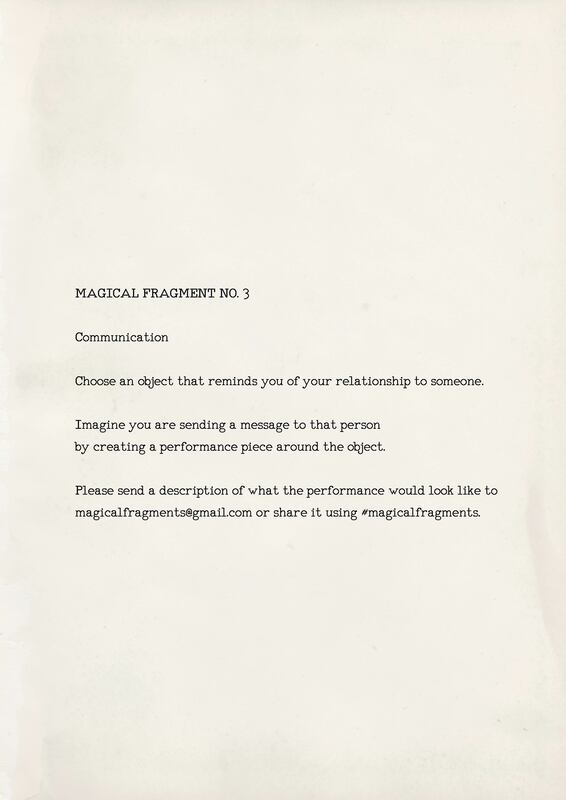 Magical analogy connects with an alternative mode of reality that is more than just the visible and tangible world and involves an evocative transference of meaning from one connection to another connection (Greenwood 2012). 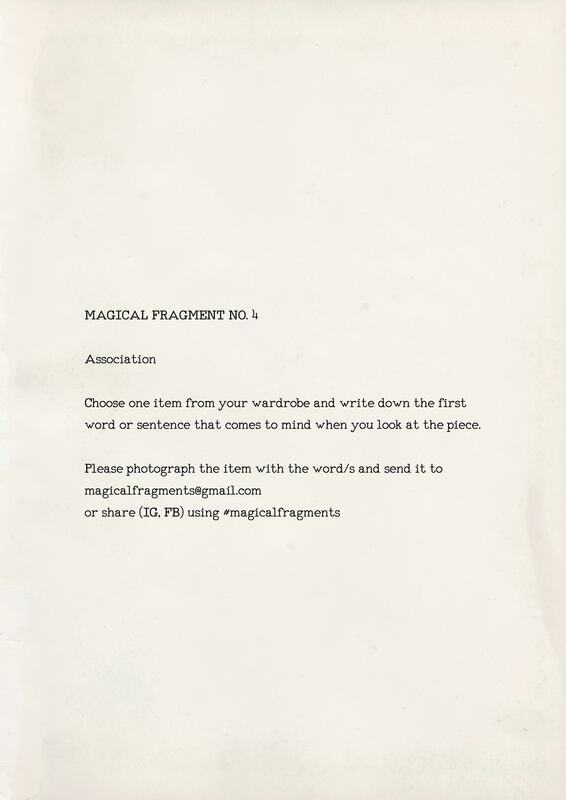 The magical thought is chiefly emotional because it is constructed from affective connections that develop over time (Greenwood 2012). Have you ever struggled to discard an object because it was linked to evocative memories or an important person in your life? 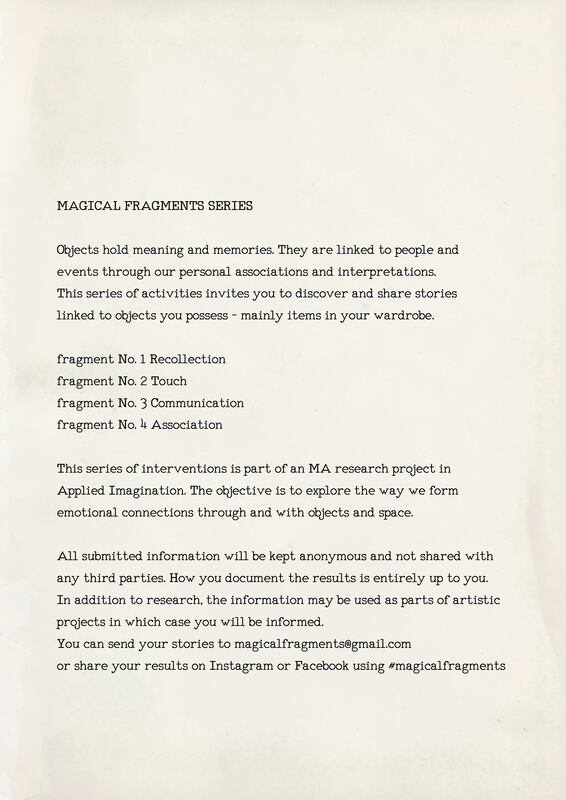 Not wanting to part with an object because of your emotional connection with it is a type of magical thinking. You may feel that by losing your physical connection to the object you are also losing the emotional connection to the person or memory – by severing the physical connection you also let go of the emotional connection. 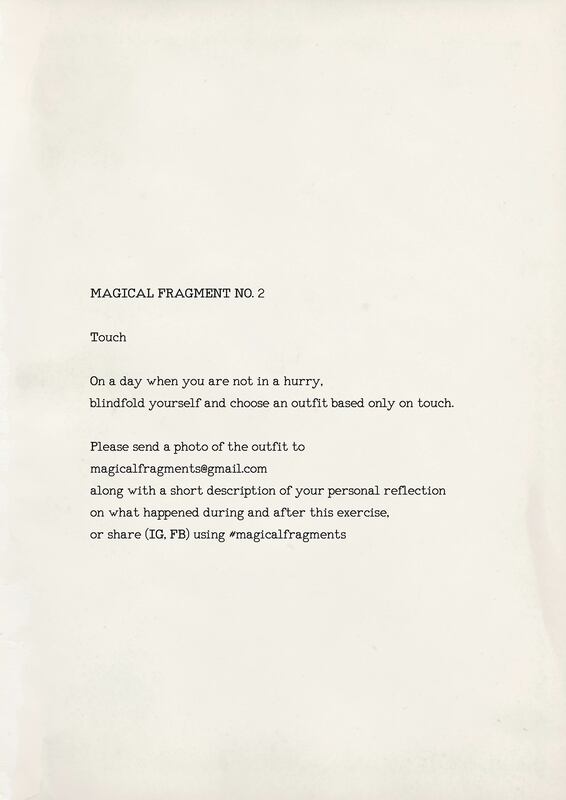 This type of magical thinking also happens in reverse, where negative memories or feelings are let go of through physical transformation of symbolic objects representing the relationship, such as in grief rituals. The objects we surround ourselves with are linked to our narrative identities – our personal stories. Humans are obsessed with stories. As (Gottschall 2012) poetically puts it in his book The Storytelling Animal, ‘We are soaked to the bone in story.’ Our lives are so influenced by stories and a variety of story-like activities that scientific studies suggest we have about two thousand daydreams per day, meaning we spend up to half of our waking life daydreaming – telling ourselves stories (Gottschall 2012)! If you start paying attention to your stream of consciousness you may discover that daydreaming is your brain’s default state (Gottschall 2012). If we tell ourselves stories to make our lives coherent and meaningful then could personal storytelling perhaps be considered a form of individual, everyday therapy? Would our inner worlds crumble completely without it. Our story is after all what shapes our lives and the reason we exist. If we fail to give our story meaning and embed it with a healthy amount of ignorance how does it affect our emotional well-being? A depressed mind is dealing with a broken story, as is suggested when Gottschall (2012) references psychologist Michele Crossley, who says that depression frequently stems from an ‘incoherent’ story, an ‘inadequate’ narrative, or a ‘life story gone awry’. If the mind doesn’t tell itself flattering lies, it is not healthy (Taylor, Gottschall 2012). Although the latter statement seems a little problematic – what is a ‘healthy mind’, what is a ‘healthy lie’ and where do you draw the line between harmless lies and dangerous lies – there is perhaps something to it. Studies have suggested that depression is often linked to a highly realistic view of the world. In other words, a worldview lacking in flattering lies and optimism? This would indicate that storytelling with a healthy dose of ignorance is, at least to some extent, good for our emotional well-being. So how can we use emotional objects and our obsession with stories to add value and empowerment to our personal narratives? What does a process of ’emotional archaeology’ and ’emotional alchemy’ look like? I have a black dress that has just been hanging in my wardrobe for the past 8 years (at least). It never fails to remind me of a specific moment with a specific person. At some point the essence of the dress shifted from that of an object to the recollection of a feeling; I no longer see the dress when I look at it, I feel. Reflecting on my emotional connection to the dress I realised that I have not worn it a single time after the person left. However, there is absolutely nothing wrong with the dress. In fact, I have always been very fond of it, it fits me perfectly, and it has a timeless style. Out of all the dresses I have ever owned it is one of my favourites. Yet it continues to simply hang in my wardrobe but I could also never bring myself to part with it. The Oxford Dictionary (www.oxforddictionaries.com, 2018) defines poetry as ‘literary work in which the expression of feelings and ideas is given intensity by the use of distinctive style and rhythm’ or ‘a quality of beauty and intensity of emotion regarded as characteristic of poems’. Above is a poetic interpretation of the black dress. I was thinking about ways in which I could convey the feelings I associate the dress with, to someone else; how could I extract them to convey a memory of a moment in the past? Emotions are highly individual and our memories are never entirely objective, and therefore a purely analytical recollection of an affective connection would be nearly impossible and would probably fail to transport another person into your personal memory. However, by giving us a language with which we can create moments of emotion and empathy, poetry presents possibilities for expressing feelings and thoughts that are otherwise difficult to express due to their complex nature. Clothing is not simply a material object. It is closely linked to the body and ultimately does not exist unless there is a body; clothing is always designed for the body – even when it is not intended to be worn. Clothing constructs a personal habitat (Abbot and Sapsford 2001 referencing Craik 1994), where the clothing and self become entangled with people and moments (Banim and Guy 2001). Banim and Guy (2001) have observed that sometimes the clothes themselves and the images they portray are much less important than the ways in which they represent a relationship with people who are (or have been) connected with the clothes. Because of its close and intimate proximity to the body, clothing has the potential to carry deeper emotional meaning than many other objects. This becomes particularly apparent in the case of ‘a boyfriend’s T-shirt’ and the wardrobes of lost loved ones, as in the following quote, which illustrates the role of affective objects in our personal narratives and the intimate emotional connection to a lost loved one’s wardrobe. Dress shapes our identity and vice versa, we choose our clothing based on our present state, we hold on to clothing that is no longer being worn, and we wear or do not wear items because of what we associate them with. But exactly how much do the relationships we have to our clothes, as well as other people’s clothes, shape our narrative identities? And how can the affective connections in our wardrobes be used for self-reflective and therapeutic purposes? How do we extract the poetry that is lined along the seams of our clothing?